Once again, thanks to NIS America, I can bring you another review, this time of the PSN game Clan of Champions. In this game, players will take on the role of a mercenary for the king and root out the evil in an ancient ruin. Graphically, the game is fairly standard. There's some good detail on some of the equipment like rust, dirt and such. There is also a good variety of armor and weapon designs, which is a plus. However, there are not many different stage designs. You will see similar courtyards and stone hallways several times while progressing through the game. In a similar vein, there aren't many enemy types, just the three playable races and skeletons. Though in a nice touch, enemies will have cuts on their bodies when you damage them. 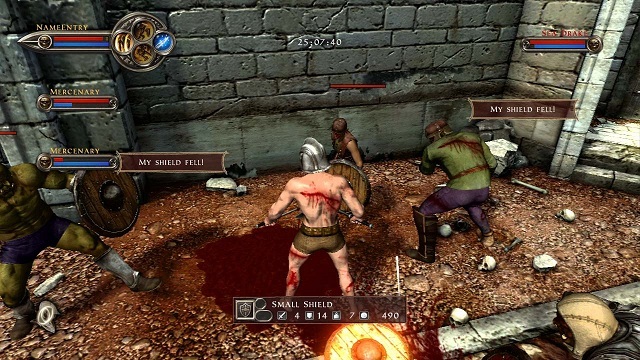 There's also lots of blood, especially when you damage and enemy near a wall, and leave huge splotches of blood on them. Thankfully, the skeleton enemies don't leave them, though. There are no voices in the game. Well, unless you count the assorted grunts and moans as voices. All of the story is told through text on the quest descriptions. While it's nice that it so optional to read the plot, I fear most players will miss it and think it's not there. There's not much music, and some of the battle music reminds me of God of War. The battle system takes a bit to get used to. If you have played the PSP game "Gladiator Begins", then you'll know how this works. You can attack high (triangle), middle (square) and low (X). There are three different styles: sword & shield, dual wield and close combat (fist weapons). Each has different strengths and weaknesses and can combo the attack heights a different number of times. For example, the close combat style can chain attack high three times, mid two times, and low once. Most times I wish that you could chain more attacks together. There's also a roll/dodge move, but it provides no invincibility (as far as I can tell). The enemy AI is expert at rolling and will frequently use it to escape constant attacking. The few times I need it, it doesn't seem near as helpful as theirs. I don't know if they actually have a different roll, or if their agility score is higher than it should be. What really sets this game apart is how armor and damage are treated. Armor on different body parts takes damage instead of the player's health bar. After sustaining enough damage, the armor will be knocked off (shield or helmet) or outright broken (chest, arm and leg armor), which allows characters to take damage in the exposed region. It's fun to start wailing on a poor sap and shatter his (or her) armor so you can do some actual damage to them. Head attacks do the most damage, but helmets can be picked up again, so sometimes the best bet is to break the chest armor. Personally, going for lots of head attacks works more often than not, so I stick with that. The only thing more painful than the cuts is using bactine on them later. However, the same thing can happen to you if you aren't careful. Thankfully, equipment is not permanently gone, even if broken or pilfered by the enemies. Yes, pilfered because equipment on the ground can be picked up by anybody. This makes battles can be very fluid, but annoying when an enemy grabs your nice helmet or weapon. The only time this was a huge problem to me was the second to last level. While fighting the target, up to 4 skeletons at a time can join in to fight you. They also spawn in with no equipment, so they can steal anything you or your team drops. At first I thought the game was nice for spawning naked skeletons so they wouldn't be too hard to kill, but soon realized that it was worse for them to have nothing. I suspect there are nuances to the combat system that I just don't understand. The in-game tutorial is fairly basic. I couldn't find any info for mastering the combat. Sometimes and enemy seems to counter attack (and are not using the skill that does this), as if there was a parry move of some sort. They also seem very adept at rolling out of harm's way, but I can rarely pull that off. Several times they get in a shot on me and I stagger back while being completely open to their teammate's barrages. Whenever I am double or triple teaming an opponent, my hitbox seems to push me to the side while my AI just gets in my way. Also, some of the "boss" characters have ridiculously high agility, strength and equipment durability. Later in the game, they are capable of destroying your at-level armor with a few hits. It's frustrating to get completely destroyed by the computer because they block, then counter, then unload on you while you stagger and you can't roll or block your way out. Most level ups for the different styles will unlock an attack skill that you can map to the controller or a passive that you can equip. There are lots of different attack skills, magic spells and passive skills that you can unlock in the game. When you first make your character, you get bonus stat points to customize them, but these are unfortunately the only time you can upgrade your stats without passive skills. Most attack skills are useful, but all are fairly mundane. They are meant to be somewhat realistic, so you don't shoot giant beams from your sword or crack the earth at your feet to attack. The magic spells are what will give the battles flair. I especially like the ones that give your attacks elemental effects, so you can do damage through the enemies' armor. There are lots of spells and skills to collect, and trophies accordingly. He's not The Rock, but he sure is electrifying. There are 24 stages in the game, and completing one will open the next. Each stage can be done on 4 different difficulties. It would be nice if beating a stage would open it on all difficulties, but they don't. So, to get all the trophies, you have to do each stage 4 times, for a total of 96 stages. There's also 3 different weapon styles to level up and lots of gear to collect. This ensures that my completionsit nature kicks in and plays stages many times to stock the store with all the equipment. There's a lot of stuff to do, but it is still grinding. The stages are fairly short, though, which is nice for replaying them. First off, I was surprised the game had a platinum. Well, since my friend claims there was supposed to be a disc version for the Xbox 360, I guess I shouldn't be too surprised. Most of the list is pretty standard, as you will have to beat all missions, on all difficulties, and get high ranks on them. You'll need to max out your levels and sell lots of things to the shop. Unfortunately, there's a few trophies for playing multiplayer (co-op and versus), but finding a game is near impossible. After sitting in a lobby for awhile, I got one person, but it would boot one of us when trying to start the level. I attempted it a few times to no avail. Admittedly, I have little desire to play versus, but I would try it out if I found anyone in those lobbies. It would be much more fun to play the game with actual players, since the teammate AI isn't too great. They have their moments, though. While the levels are short, you are meant to do them several times to get more money, experience and equipment. So even though you grind a lot in the game, it doesn't feel very tedious to me, since the levels are short and you get stuff fairly quickly. I don't know how fun it will be to do all levels on 4 different difficulties, but I would certainly try if I could find some co-op lobbies. The game is very average on all counts, but I still had fun playing it. If you want to spend the $30, Clan of Champions is a decent game to play in short bursts or when you have some extra time. If I can ever get into a multiplayer co-op or versus game, I'll of course put an update here on my blog.